Summary: Take a box of tissues and be prepared for a lilting, affecting drama from thesp Will, not wise-cracking or action Will, and you wont be disappointed. 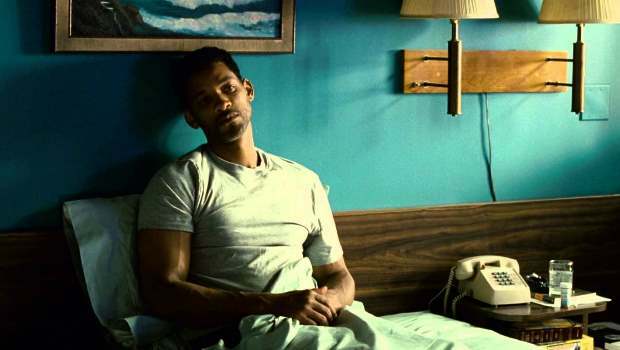 In Seven Pounds we find William in a somewhat altruistic frame of mind, in this touching tale of redemption, guilt, and a different type of suffering. A far cry from Smith’s big budget sci-fi / action epics, Seven Pounds nurtures an interesting premise to a bittersweet conclusion. This so aptly sets the pace for the journey, as we can’t quite get a grasp on Smith’s agenda or the motivation behind his actions. As preceding events are told in flashback, we see him use his position as an IRS agent to inadvertently help certain people he’s ‘investigating’, whilst being slightly less lenient towards others. But why is he so intrusive, introspective, even aggressive at times; he almost seems to be stalking them. Vetting and analysing possible beneficiaries of his purported generosity, whilst intermittently hinting that he has the ability to change their lives – drastically. Smith’s character takes philanthropy to a whole new level, as he scrutinizes a bunch of people who seem to be suffering in one form or another – from ailments to domestic violence, he’s on a mission to help. Though when showed any real affection in return, he seems very out of sorts and begins to question what it is he’s doing. But what is he actually trying to achieve and how does he intend on helping them? In between all this, he finds a reason to put aside best laid plans when he falls for one the benefactors (Dawson) of his generosity. But the question is, Does he…? The title refers to Shakespeare’s The Merchant of Venice, where a wager is set and the debt to be paid if unfulfilled, will result in a pound of flesh being taken. Its’ literal meaning these days is that no circumstances will prevent the debt from being repaid, whether it results in devastating circumstances, or even the loss of life. The narrative is somewhat moody and meandering, but you come along for the ride thanks to Smith’s charisma. Interspersed with flashbacks of a loving partner and glimpses of a happier earlier life, it takes the graph of the film to realise the how’s, why’s and when’s. As with The Pursuit of Happyness, Muccino brings a certain sensibility to the film. It’s stark yet sensitive and you’re always just an observer, yet a very much engaged one. He guides you with care, taking the many unravelled threads of the story to a succinctly satisfying patchwork by the concluding reels. Ben’s at times seemingly erratic behaviour makes much more sense pre-climax, especially his slating the crap out of blind meat salesman Ezra Turner (Harrelson). With Smith as Ben, initially you just feel his anger, as the story unfolds you begin to understand it… Harrelson lends a certain dignity to his role, but it makes you ask – where the hell has he been the last few years (and why is he doing something so relatively insignificant?). Pepper is an interesting choice as Ben’s best friend, and it’s great to see Dawson in a welcome change from her typical action bit parts. She’s peachy as ill card-maker Emily, and a great foil for the final shocking, albeit devastating payoff. In retrospect, the film is based on quite an audacious premise, but Smith and Muccino slowly but surely pull it off. This is seriously emotional, sensitive, some may even say schmaltzy, but a far cry from a date movie… Take a box of tissues and be prepared for a lilting, affecting drama from thesp Will, not wise-cracking or action Will, and you wont be disappointed.